Artopex Wood Veneer Conference Room Furniture |Artopex| Alliance Interiors Inc.
Artopex manufactures a large selection of wood veneer furniture to suit any size boardroom, meeting, conference or training room. Artopex manufactures boardroom tables with wire management or grommets for any cable management. Pop up power receptacles for voice, data and electrics are also available. Artopex also manufactures many accessory pieces such as credenza units, that accommodate audio visual. Cupboards for storing manuals, DVD’s videos and audio cassettes. 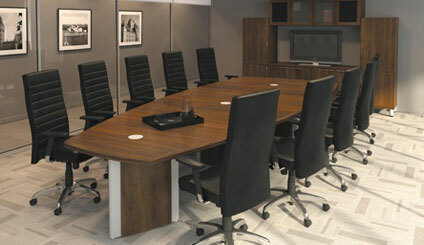 Artopex Wood Veneer Boardroom Furniture. Artopex Wood Veneer Boardroom tables can bring a strong corporate image to any company providing a consistent look to impress your clients. Artopex conference tables are available in a wide selection of sizes, finishes and configurations. Artopex wood veneer boardroom furniture can also accommodate your power requirements with electrical pop up modules. As you can see here, we also have an audio visual centre. To compliment this space and bring comfort to your meeting room, Artopex carries an number of comfortable and affordable conference room leather, fabric or vinyl chairs. In this group setting we are showing the Sentinel high back boardroom chair in leather with chrome base and casters. Call me so I can help you !